Congressman off the hook – mauled guard won’t file charges – CHUBIBO! ABS-CBN News shared the latest update on the recent security guard mauling incident (via Nina Corpuz). A security guard who was allegedly punched twice by Lanao del Sur Rep. Mohammed Hussein Pangandaman will no longer file a case against the lawmaker because he is afraid of him. Security guard Ricardo Bonayog failed to show up at the Commission on Human Rights after deciding that he will no longer file a complaint against Pangandaman. In a phone interview with the media, Bonayog said he is withdrawing his complaint against Pangandaman because he feared for his and his family’s safety. “Ang kalaban ko po malaking tao po. Ako po ordinaryong tao lang,” he said. Bonayog assured the media that nobody talked to him or threatened him to back out. He, however, said he would like for the congressman to make a public apology, but also said that he has already forgiven the congressman. Dela Cruz said the CHR cannot do their own investigation just by relying on Bonayog’s account. “There is always due process,” he said. The security guard earlier said Pangandaman punched him twice on the left ear after the lawmaker refused to let Bonayog inspect his Porsche Carrera at the Ayala Technohub at the UP Campus, Diliman, Quezon City. Pangandaman claimed he hit the guard after the latter appeared to be drawing his service firearm. House Majority Leader Boyet Gonzales earlier said the House of Representatives cannot investigate Pangandaman in proceedings before the Committee on Ethics and Privileges unless the security guard files a complaint. 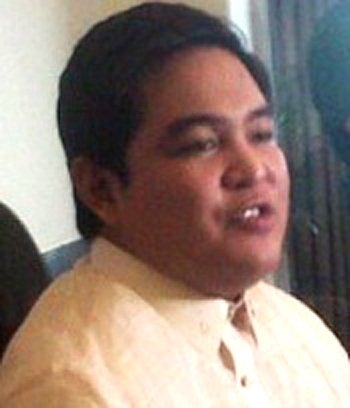 Gonzales noted that if proven true, Pangandaman may be suspended or expelled. So will Bonayog be under the witness protection system, if there is such in our country. I just hope that this thug will not cause any more harm to Bonayog & his family. He does not even deserve to drive a “kariton”!!! gago yan REP. MOHAMMED HUSSEIN PANGANDAMAN na yan! dapat patayin na yan kasama ng mga AMPATUAN!!! PUTANG INA NYO!